Thickening is the first, and frequently inevitable, step in reducing the volume of sludge extracted from the water line. In fact, it is used to optimise the subsequent conditioning, stabilisation and dewatering stages by reducing structure sizes and operating costs. Extremely dilute sludge delivered by the water line (usually 99 to 99.8% water)is concentrated to produce sludge containing 90 to 96% water. This sludge is still fluid and, therefore, can be pumped out. very noticeable reduction pumping, transfer pipelines and any intermediate storage tanks (if applicable). 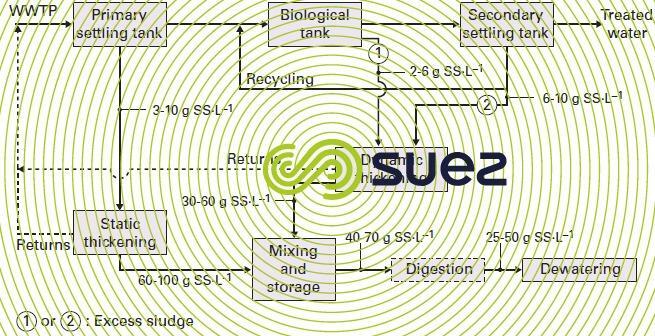 A cyclone sometimes has to be used to remove grit from industrial, mineral and sandy sludge: the cyclone will be installed at the inlet to the static thickener, on dilute sludge, in order to achieve the best separation performance.